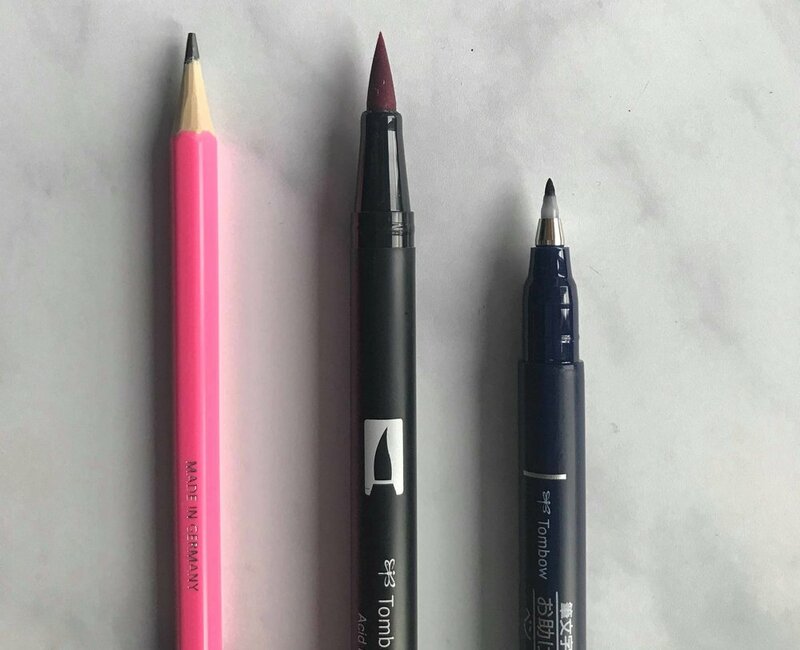 My Top 5 Calligraphy Tools - I can't live without the last one! There is so much variety and options out there on the market right now when it comes to lettering. There are also so many mediums, tools and methods that you can take too. From chalkboards, mirrors, pointed pen and brush lettering, the possibilities are endless — and to be honest, can be really intimidating! Hands down, my favourite go to tool/pen is the Tombow Fudenosuke brush marker/pen with the hard tip. This little baby goes everywhere with me and I keep it stocked at all times. I love to use them for my workshops too. The hard brush tip makes it easier to control (especially for beginners). You can get gold line variety and quality with the thick’s and thins. I use this pen often in my bullet journal, smaller projects like cards and onsite live calligraphy on paper and some items. I go through this stuff so much and a 50 sheet pack of tracing paper will last you a long time. It’s perfect to get your practice drills in, draw up and revise drafts, and it’s pretty to layer with other projects. I always recommend to my students to date your practice sheets so that you can look back and see your progress. I do this with all my practice pads. Where are my pointed pen pals at?! When I first started practicing calligraphy 5 years ago, I struggled hard! The right tools and preparation are key. I can’t even tell you how many times I’ve aimlessly wondered Micheals for the right “calligraphy” tools. News flash — Micheal’s suckssssss for calligraphy tools. They have gotten better but they still need to come up to speed in the modern calligraphy realm. I much prefer the oblique pen holders for their angle. I’ve tried and struggled with straight holders. I will say though, if your a lefty - the straight holder is for you. My go to nib is the Zebra G. It’s flexible, you get great line quality and it’s great for beginners. I have a love hate relationship with these guys. I mostly use the oil based Sharpie Paint pen —They are what I use for mirrors and acrylic. They are semi permanent which means they will start in place unless you use soap and water (water based) or nail polish remover/windex (oil based) to remove. Ok — the iPad is a total game changer when it comes to lettering. It makes digitizing work, mapping out sketches for clients, and pressing “undo”. The Apple Pencil is pressure sensitive to you can get great line quality and variety. There’s also a bunch of pens, brushes and effects you can use too including watercolour, Pencil, paint, and calligraphy nibs. What are you favourite tools and must haves? Share in the comments below! Want to learn calligraphy? Check out our upcoming workshops.